We just finished watching another spectacular Masters golf tournament at the “shrine” of professional golf in Augusta, Georgia. My brother Dan and his wife Andrea had the pleasure of living in Augusta for fifteen years while Dan worked for a multi-media communications company whose founder is one of the members at Augusta National Golf Club – a very exclusive group. Andrea is a very talented architectural illustrator with a specialty in golf course illustrations. This painting of the famous 12th hole is the gateway to what is known as “Amen Corner” where championships have been won and lost. Just ask Jordan Speith about this hole. Maybe more than any other golf tournament, the Masters is revered and coveted – the definition of world class signified by the Green Jacket awarded each year to the Masters Champion. The Masters and Augusta National Golf Club are also famous for their world class guest experience and attention to detail. Being a “spectator” here is to be pampered like nowhere else. During Masters week, I was speaking with one of my clients, the CEO of a national restaurant chain. We were discussing the dynamics involved in organizational transformation and mobilizing the team. Like at The Masters, it struck me that there are at least three categories of leaders and team members in most organizations – spectators, commentators and players. Spectators are those who take a “wait and see” approach to things. It is very unlikely that they will initiate action or proactively reach out to examine, explore or innovate. Some will be quick followers chasing after the real players to get up close and personal view on things – but definitely stay behind the ropes and not likely to stick their neck out. Commentators come in a few varieties. Some were players, once upon a time, but now tend to just critique others or talk about how we used to do it in the good old days. Others never really were players but either studied other players or gained academic learning. Not all commentators are negative. In fact, some can bring added enjoyment and insight to the overall experience. We might call them champions of positive change. 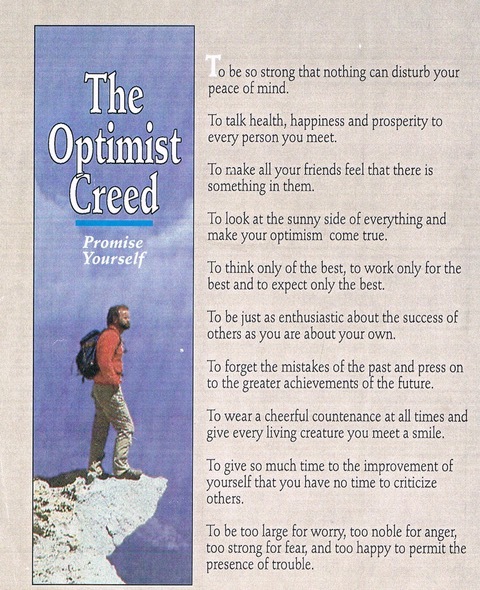 These champions live by the tenets of The Optimist Creed from Optimist International. Within organizations, we sometimes run into commentators that can tend to add their own spin and contribute to negative resistance building. Just as in an electrical grid, these can be agents of drag – creating negative polarity and reducing organizational aerodynamics. We sometimes call these agents – squirters for all the negativity they spread. Finally, there are the Players. These are the valuable, talented and courageous who are willing to do what it takes to hone their skills and get “inside the ropes”! Patrick Reed is the latest example as the 2018 Masters Champion. He may not be the most popular champion ever but no one doubts his determination and grit. In our organizations, we need a full cadre of players at all levels. We need players who can play at faster speed, capable of taking initiative, making decisions and being accountable to themselves and others. We need team players who understand the ethic of cooperation and can operate across borders and functions to actively collaborate. We want and need players who will buy-in and champion the values and operating principles that define who we are and what we stand for – not just some of the time. We must have players committed to being the best and treating each other and all stakeholders like guests at Augusta National. Especially senior leaders responsible for shaping the future and developing tomorrow’s talent. Take a fresh look within your organizations. Do you have spectators, commentators or players? I hope you have a high percentage of players – that is what is required for agile organizations and that is what is needed to compete successfully in this VUCA world – volatile, uncertain, complex and ambiguous. By the way, if you would like to get your own signed print of hole #12 shown above, please contact Andrea O’Shea.